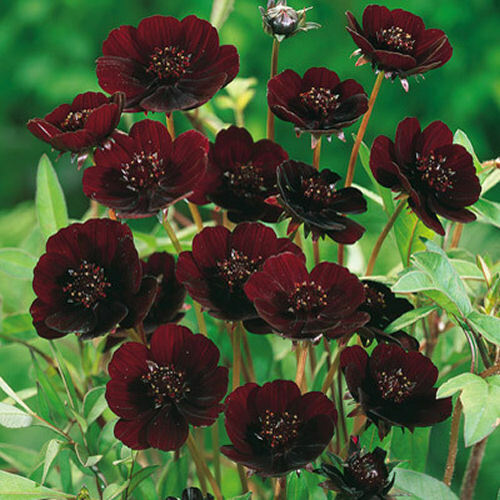 There are many chocolate colored flowers available, but Chocolate Cosmos gets a special boost. I give it this rating because, not only does it have a lovely dark chocolate fragrance, but it is also one of the top 10 rarest flowers in the world. The plant is a perennial and is easy to grow and a stunner in the garden. Imaging walking through your garden and getting a whiff of dark chocolate with a hint of vanilla wafting from a pretty chocolate colored flower. You have just happened upon a chocolate cosmos! 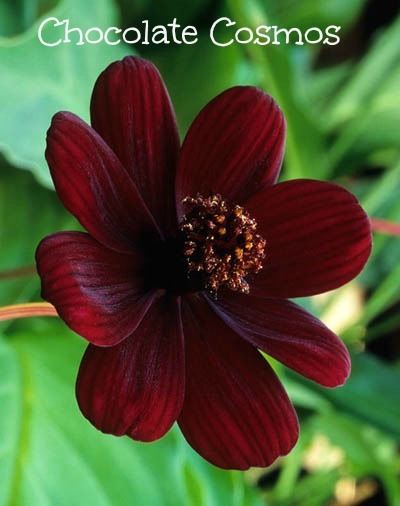 Chocolate Cosmos has a lovely Chocolate color and Dark Chocolate Fragrance. This variety of cosmos is a native to Mexico, but has been extinct in the wild for over 100 years. Chocolate cosmos (Cosmos atrosanguineus) is a perennial plant with a fleshy tuberous root. The flowers are red to maroon brown with a center raised area. The plant has a dark chocolate fragrance that becomes more noticeable as the day wears on. The center of the flower forms in a cluster like appearance and opens into the traditional cosmos shape with velvety petals. Once the flower has died, the plant will benefit from deadheading, which will encourage additional blooms. Once open, the flower has a cupped appearance but keeps the stunning cluster center that makes it so interesting. The color can vary from reddish brown to deep chocolate. If you can find a plant, it is fairly easy to grow, as are all Cosmos. 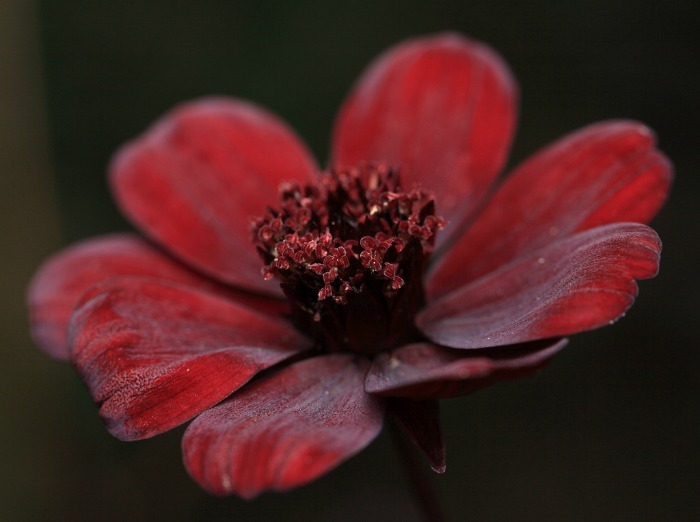 Chocolate Cosmos can get by on rather dry soil, as long as it is amended. Avoid waterlogged conditions, or the tubers will rot. Chocolate cosmos makes wonderful cut flowers and does a great job at attracting butterflies to your garden. The Clumps get larger with each passing year. The plant likes lots of sun and a well draining soil. It is hardy to about 20 degrees but can be dug up and stored for the winter the way you do with dahlias. Raised beds and organic mulch help to maintain even moisture. Propagation is by division of the tubers. This is best done in early spring or fall. Chocolate cosmos should be grown in a border or in containers where the flowers and fragrance can be appreciated up close. They make very good cut flowers. This plant comes with both good and bad news. The good news is that it is a perennial, so once you find one you don’t have to replace it every year (as long as you dig it up and save it). The bad news is that it doesn’t throw fertile seeds, so this plant only propagates by its roots. I grew cosmos for the first time a few summers ago. It is prolific when it comes to bearing flowers and a delight in my garden. 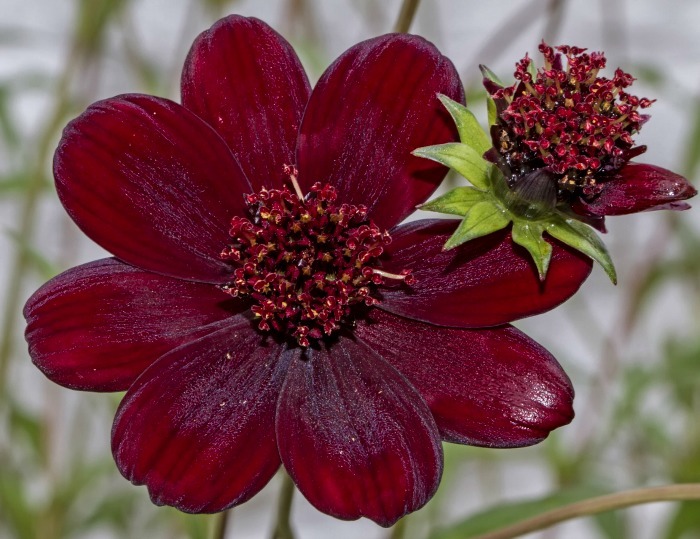 Chocolate Cosmos (Cosmos atrosanguineus), as a plant, can be found in limited amounts for sale at Burpee, New Garden Plants, and Joy Creek Nursery. I have seen seeds for sale on Amazon, but cannot vouch for them, since the plant throws infertile seeds. Another plant which is available as seeds is Osiria rose , which are sold on Amazon, and likely will not grow. 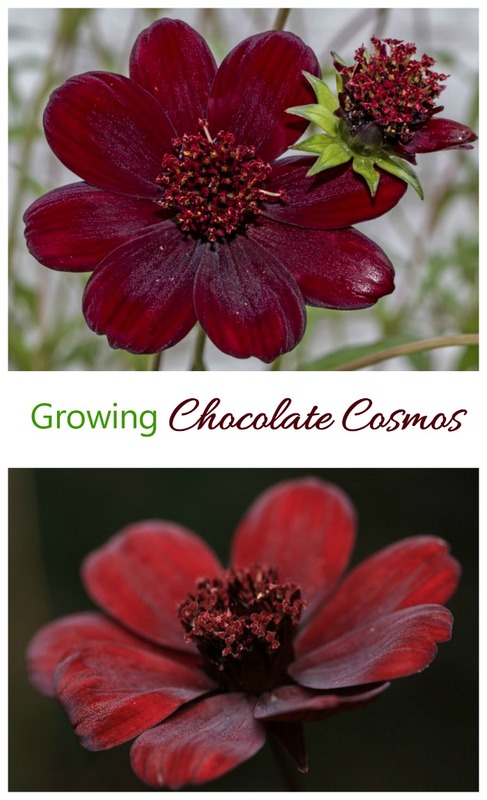 Have you had any luck growing Chocolate Cosmos? What good would it do to buy the seeds if they are not fertile?. Thanks! Oh my! It’s my first time to hear about Chocolate Cosmos Flower. It looks stunning in the picture and does it really smell dark chocolate with a hint of vanilla?? Then,we’ve got to have this flower in the garden. I bought my seeds from Ebay, to be fair I didn’t hold out much hope! However, what a shock I got when I planted them in a Belfast sink buried in the ground at the bottom of my garden! Planted the seeds in Miracle Grow Compost & the plants are huge!!! Two plants have shot up with an abundance of leaves about 2ft tall!!! Alas, no flowers or fragrance yet, but I am ever hopeful! I bought them as choca-mocca ones, so we shall see! The green tubers and leaves are huge, about 2ft tall and I was starting to think I had bought carrot seeds 🙂 We affectionately call them Magsy’s Carrots at home, as they are planted in the sink/planter that is a memorial to my mom (Magsy). I will keep you posted if they do flower, as I’ll be most excited! Just an update on the Cosmos situation. We now have buds on the tall green leafy stems. Not sure what colour they will be when they come out yet, but there are quite a few and the stems are starting to turn brown from the bottom up – hopefully this doesn’t mean they are dying! Will update again when the buds burst into flower. Deborah, Any update on your cosmos blooms? I found a website explaining that someone found or created a mutated chocolate cosmos which bore a few fertile seeds, and semi-fertile cosmos have been born from this plant. BUT that website was also selling chocolate cosmos seeds, so it could have all been crock… Looking forward to hearing back from you.